Camping… wind rustling tree-top branches, imitating with amazing precision the sound of a river tumbling and swirling through a rock-strewn channel… musty-comfortable scent of well-worn canvas tent walls… camp-fire smoke twirling and twisting, and burrowing its pleasant burnt-wood odor permanently into my old wool sweater… rain-drops pattering gently on tent roof and walls, singing their lullaby, reaching out and drawing me into sweet dreams… fresh, crisp, early morning air icily chilling my backside simultaneously as bright camp-fire flames cook my face… mouth-watering breakfast scents of bacon and pancakes sizzling on an old-fashioned iron fry pan propped on rocks at the edge of the fire… rays of sunlight gently filtering through the lacy canopy of an ancient, gnarly barked, towering pine, green-brown and dark against a clear summer-blue sky, as I lay back in utter comfort on a soft bed of mossy grass and let my mind wander back through memories of so many summers spent camping out in God’s great, wide, amazing creation…. I have few memories of my early years, but dad’s other passion, photography, proves that we did a lot of camping, right from the start. My first clear memory, though, took place the summer I turned seven. I had two younger brothers by then. We drove south from our home in the Okanagan Valley of British Columbia, across the border into United States. We drove through the mighty Grand Teton range of mountains, their jagged peaks covered in snow, and down to Salt Lake City, where we of course went to see the Mormon Tabernacle grounds. While there, arid Salt Lake City experienced a freak rainstorm, with 2 inches of rain falling in a few minutes. When we got back to our tent, which we had pitched by a lovely little stream, the stream had turned into a pond and our tent was floating! Needless to say, we spent a rather wet night! Then we went to Yellowstone Park. We arrived the day of my birthday. While Dad pitched the tent, mom started a campfire, so we could celebrate my birthday with a marshmallow roast. Mom was roasting a marshmallow, when it started to burn. As she pulled it away from the fire, it flew off the stick and stuck to my leg, still on fire! I started jumping up and down and screaming. My dad, hearing my wails, came running out of the tent, banging pot lids together and shouting at the top of his voice, sure that the bears had attacked me! The summer I turned 16 I planned to finally have a birthday at home with my friends, a big party at the beach. Alas, it was not to be so. Dad planned an “educational” six-week trip right across Canada, from Victoria BC to St John’s Newfoundland and back. What an education it was! All six of us spent up to 12 hours a day sitting in the car, watching our great country speed by. At night we cozily squeezed together in our 4 person tent-trailer. Lunches were often spent at dusty, sandy road-side picnic tables eating cold canned pork-and-beans on bread (no butter)! Of course we did stop and view interesting sights – like every historical military site in our wide nation! Okay, so it wasn’t all bad. We celebrated my 16th by visiting the Ontario Science Center and riding the subway in Toronto, which was fun. We had some, shall we say, challenging experiences: for example, we stayed at a campsite in Quebec that had one bathroom for everyone, male and female, and the shower curtains were not nearly as wide as the stall openings. And for some reason, I seemed to have a fatal attraction to water. For example, I fell into an oil-slick on the St. Lawrence River in Ontario; and I slid down a great slimy rock into a Maritime pond full of great, icky tadpoles, each the size of a baseball; it took my whole family, holding hands together, to pull me out! And somehow, sitting all those thousands of miles, I gained 2 unwanted inches on my backside! Oh the joys of camping adventures! Still, I did come to know my country much better. After I grew up, married, and had children of my own, we lived on the Queen Charlotte Islands (Haida Gwaii) just south of the Alaska Panhandle. We camped there many times. There I fell in love with the great coastal rainforests and the bountiful seaside. We spent many, many happy hours beach combing on the long, wild, sandy beaches, and exploring tidal pools full of richly colorful sea life. We hiked through the forests, and swam in clear mountain lakes. I thought it was wonderful. My husband, however, thought it was way too much like his every day childhood life, as he had grown up in a remote village without electricity or running water! And my daughters, especially as they grew older, thought it was much nicer to stay home where there were hot showers and soft warm beds, and where one could stay out of the frequent showers (okay, downpours) of those “Misty Isles.” Gradually we camped less and less. 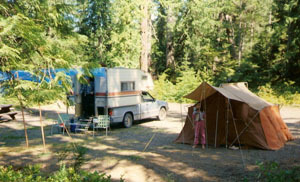 But now my children are grown, and my husband has grown perhaps far enough away from his childhood memories to be willing to try camping again. This spring we bought a new tent, camp stove, and other basics. We’ve started by camping close to home, which in the cycle of life turns out to be back in the Okanagan. And we’re heading to the Rockies next. The wind still rustles in the tree-tops, the rain-drops patter on the tent roof, the bacon and pancakes sizzle in the pan, the smoke still twirls. Ah, camping!